In the previous article on CodeIgniter, we discussed the concept of the MVC structure used in CodeIgniter, did a “Hello world” program, and a simple program with database connectivity. Now, let’s take a look at different form APIs, built-in validations, and pagination techniques. Note: You always need to include helpers in the autoload file to access their APIs. For example: If you want to include file uploads in your application, you must include “file” in autoload helper. The above code, when simply loaded in the controller file, will give a browser output somewhat like what’s shown in Figure 1.
form_open('functionname') will create a form with the POST method by default. On submission, it will send the form data to the specified function (here, the check function of the controller file). 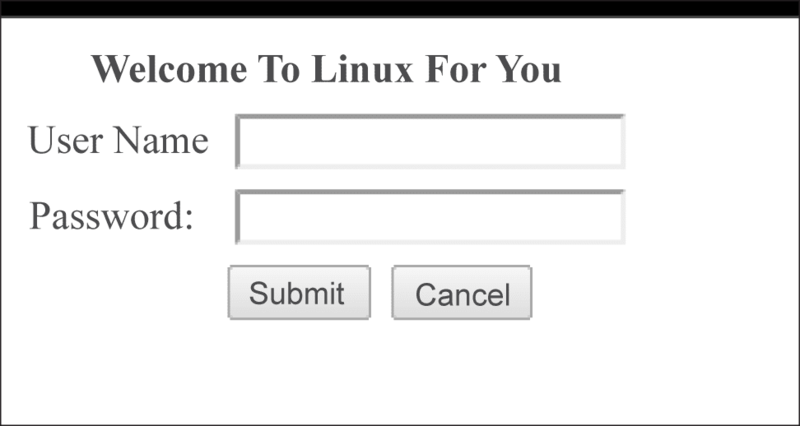 form_submit('submit','Submit) will create and perform the submit button action. Arguments passed are type and value. close() marks the end of the form. validation_errors() will print all validation errors set in the controller file. On cancellation, it will simply reload the page. We loaded the form_validation library manually, to use the built-in validation functions. We set the rules for our data fields. Arguments passed are the field name, error message and validation rules, respectively; the most important is the last one. The required rule makes that field compulsory. You can set multiple rules for a single field using a | operator between them. For example, to specify that a valid email address is required, use required|valid_email. Explore more built-in validation rules in the documentation of form_validation. In case form validation fails, the page will simply get reloaded. As explained in the view file source, the form will throw its data to the check function of the controller file. To access that data, use the built-in $this->input->post('fieldname') API of the form helper. Here, they are stored in different variables. Next, control will move to the model file, and it will check for the entered username and password in the database. If the count returns more than one, the username and password is correct, and “Login Successful” will be displayed, else “Wrong user name/password”. Submitting a form with blank fields yields validation errors, like those in Figure 2. 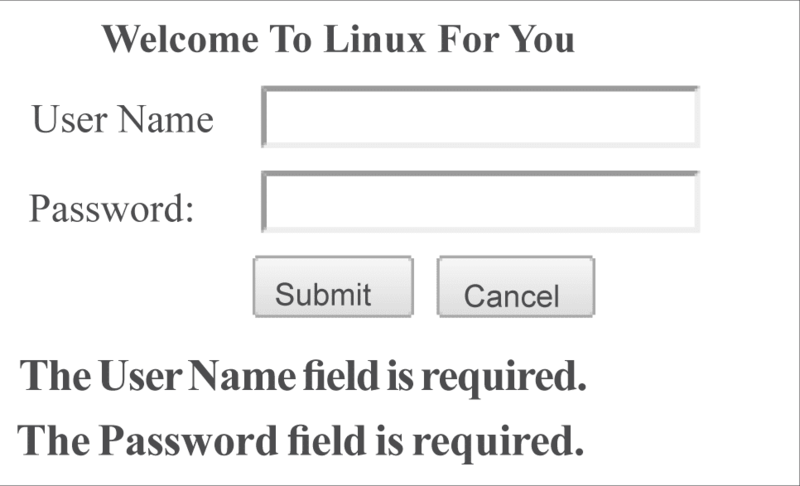 The check() function will check for the user name and password in the database, as described above. Note: I have used a simple varchar password field in this example, to keep things simple. You should encrypt the password before storing, using MD5, SHA1 types. Display grids are the simplest way of representing data. But what if there are thousands of records? We use a pagination technique to display a certain amount of records on every page. The built-in CodeIgniter pagination APIs make this quite easy. Here’s an example displaying data of seven users, paginating to two records per page (/var/www/ci2/application/controllers/displaycontroller.php). The idea is to fetch the records according to the limit set (this will also be record_per_page) and set the offset value in the URI segment. The initial offset value is 0. We loaded the pagination library. Pagination demands certain parameters to be initialised — we have created an array of such parameters. base_url is the link to which the page is to be reloaded after getting a hit on any page number; total_rows refers to the total records; per_page is the limit of records to show on one page; num_links is the maximum links allowed for display (after that, “First” and “Last” will appear). We initialised pagination with the above parameters. We fetched the created links into the pagination variable. You will see something like what is shown in Figure 3 after completing the whole program. Notice the offset value (4 in the URI); it increments by 2 (record_per_page) on each page forward, and decreases by 2, going backwards. The view file is quite simple. We can add pagination at the end, if it exists. You can apply CSS according to your needs. The first function will fetch and return all data from the lfy_users table to the controller. The second function counts the total number of records. You can also sort columns similarly; good documentation is available on the CodeIgniter Web portal. I received many emails in response to the first part of this series, saying that these things can be easily done using simple PHP also. In order that you can understand the logic, I have chosen to use very simple examples. But if you are working on a project of ten thousand lines, and need to change something in your query, I am sure you will waste much time locating the query function, then editing it. In the MVC-based framework, you just open the model file and make the change. I have worked on a very large CodeIgniter framework-based project, and believe me, it is totally worth your effort. So Google about this more and more, and keep playing with it. Suggestions and queries are always welcome. The author loves to explore open source technologies, and enjoys programming in C, C++, Java and Python. A metal head at heart, he loves to try his hands on the guitar sometimes. Sebelumnya, kita membahas konsep struktur MVC yang digunakan dalam CodeIgniter, melakukan “Halo dunia” program, dan program sederhana dengan konektivitas database. Sekarang, mari kita lihat API bentuk yang berbeda, built-in validasi, dan teknik pagination. The SMAC trend is here to stay!